kiev wrote: That is some good data on the cap voltages, and a great capture with the scope. That proves out quite a bit of stuff that is working, and every little bit helps solve the puzzle. I totally agree; thanks @Skylogger. It does take a lot of time to trace it all out, but i don't know of any other way to get the knowledge . That "lot of time" is greatly appreciated, Kenny. You've got the best team working on this including the master boomerang thrower of all time in NSW--coulomb has special skills and magic with processor code. QLD (Queensland, the sunshine state), actually. Just north of New South Wales. I'm happy to lend my processor code skills if I get the opportunity, but we were pretty lucky last time (with the Elcon/TC chargers) to get our hands on the charger firmware to work on. Firmware is usually pretty well protected. Another way to access the code is through the firmware updates, if there are any. But it seems that these are kept in Mitsubishi's hands, and never let into the public domain, is that right? i traced out the CHGP pin, pin 3 of the CN101 connector on the top board. It appears to be an OUTPUT from the OBC to the EV-ECU. There will be 3 inputs to channel 2 of IC706, Toshiba 74VHC123A, a monostable multivibrator chip. If any of the inputs make a transition, H->L, or L->H, then the chip outputs a short pulse. This pulse drives the base of an NPN transistor, which pulls the output at pin 3 Low, which is the CHGP wire running to the EV-ECU. Maybe this is a protection signal? [EDIT]: Just as I posted this, I just noticed KIEV has just traced out the same CHGP Signal, so my post is a bit redundant. I've just made a discovery by accident. All of the below checking is with charger out of the car. I measured the resistance between the Earth Ground Pin, and the Proximity pin on the Gun end of the cable. When the Trigger is pressed opening the connection just before plugging onto car, I measure 480R. When the trigger is released (connection closed with gun fitted to car) I measure 150R resistance. This all confirms what Coulomb ways saying earlier, so it appear to make things happy, a 150R value needs to be present on this line. This I believe would be the change in resistance that would be presented to the CNCT Signal on the EV-ECU Connector C111 pin 103. So for Bench testing this signal does not need to be emulated as input to the charger, just the resulting signal from the EV-ECU or relay switching that would result. While I had the charger cable connected, I was using Ohm meter to check between pins on the E-03 Connector that connects to the charger. 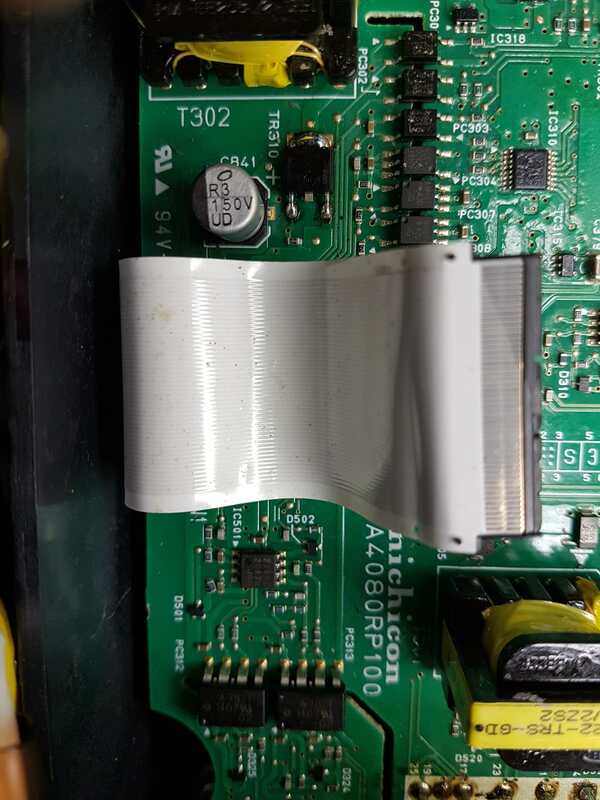 To my surprise, when I connected the Ohm meter across pin 10 (Ground) and PIN 12 (CHGP from EV-ECU) The OBC Relay switched on, you could hear the fans start, and the charging light started blinking on dash (and of coarse the Triange with !) since there was no charger installed at the time. the A-06X On Board Charger relay. This means that since the CHGP is an output from the Charger, it's not required to get the charger running on bench testing, as long as 12v is applied to Pin 12 of CN101 to simulate the OBC Relay switching on. The OBC Relay would come on, You would hear the cooling fan come on, The charge light would flash on the dash, and the Triangle with ! on dash would also come on, then after a few seconds the fan and charging dash light would go out. This is exactly what happens in the testing above. So this makes me think the Charger is also generating the CHGP signal to the EV-ECU. Also note the car being used is a wrecked 2010 I-MIEV for use as a test bed, and all of its electronics were working 100% before charger removed. The good charger was taken out and used as a replacement in another car, and the broken charger is now on bench for testing. This means any testing results with the broken charger put back into this wrecked I-MIEV are known to be results of the faulty charger and not any additional faults being added by the car. Only problem is that it's still stormy weather here, and the wrecked I-MIEV is no longer under cover (the pagola blew away) so I can't do much in car testing at the moment. So I'm mainly having to do bench testing for now. Last edited by skylogger on Thu Aug 09, 2018 12:09 am, edited 1 time in total. kiev wrote: Maybe this is a protection signal? These last two are pretty similar, indicating activity of an important part of the charger. Most likely, that the AC input is present. I was going to say that the main IGBTs must be switching, or that the power supply is switching, but that's far too late to turn on the charger relay. Surely it's not actually working at 27 V, so this must merely be for protection against spikes. What I said earlier about not seeing any CAN inputs is crazy on reflection. When the BMS detects a problem with a single cell going over-voltage, then the charger needs to back off, and it can only do that via the CAN bus. It might have backed off completely (something of an overkill) if the CHGP signal was a charger input. So it really looks like we need to send it CAN packets, or activate some maintenance device, the equivalent of the Elcon/TC chargers' jumpers, to get the main IGBTs to switch. It's also looking like we don't have to worry about a minimum mains voltage to activate some power supplies either. So we can probably start testing at say 24 VDC from a bench power supply. @Skylogger, do you have one of those? I'm guessing no because you reached for a motorcycle battery to run the charger's 12 V input. Maybe it's time for a power supply investment? At least we're pretty sure you don't need a dual power supply at this stage (most lab power supplies top out at about 30 VDC, so a 52 V requirement would have mandated a dual power supply). 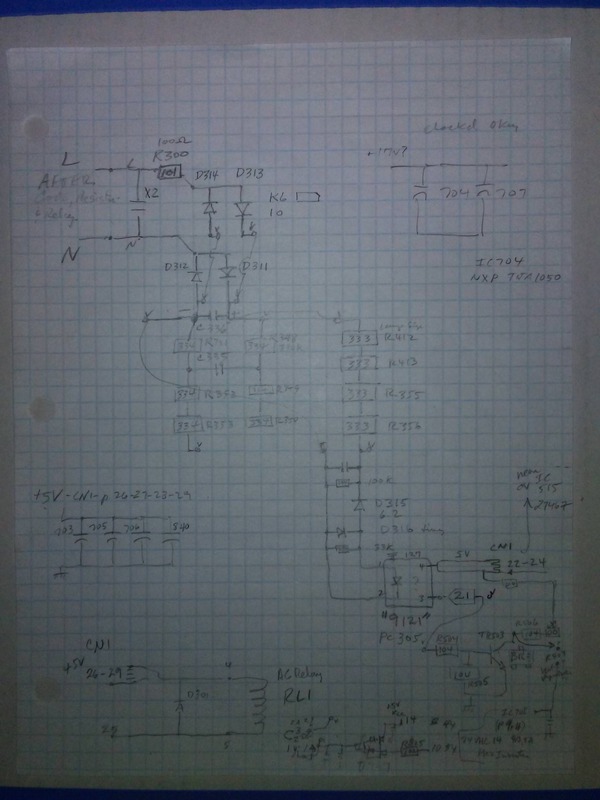 I did a test, where I connected 240VAC Mains to the terminals on the top pcb, then checked the voltage across the three big electrolytics, same as before, and measured 344.6vdc I then connected the 12v supply to pin 7 of CN101 and measured the voltage across the electrolytics again, and it was still 344.6vdc. I then also connected 12v supply to pin 12 of CN101 which would simulate the on board charger relay being switched on, and I still measured 344.6vdc. This means still no boost for the PFC even with these two 12v supplies turned on. So I have not come across any caps voltages on the TOP pcb that are affected by the PIN 12 CN101 Supply being turned off. I measured the current comming from the 12v battery supply as 174ma with pin 12 of C101 Switched off, and I measured 211ma with PIN 12 OF C101 Switched on. Coulomb: I have a Lab power supply but it only goes to 15vdc 40amps but it has current limiting. I use this for my Ham radio, so its under a stack of radio, tuner, ect. and pulling it out is a hastle, and you know how it goes with breaking something else when trying to fix something. I also have a power pack that goes to 30v fixed, but 400ma so the small current is probably to low to be usefull for anything. I do have two "electric jerrycans" which are a project I built a year ago, that is a 48vdc lithium bank connected to a DC-DC Converter that is fully programmable and controlls the output for 360vdc output that can be used for charging via the chademo port. This did not support CANBUS, so I had to do the QC RELAY Hack for this to work. I could use the 48vdc side streight off the batteries as a dc source at 48 - 57vdc. I do remember reading either here on MYIMIEV or on the AEVA site, some people talking about applying the DC output from solar panels direct to the input of the AC Charger, and let it act as a controller to charge the IMIEV Pack directly. I gave this a try way back then, but it did not work. I used the 2010 IMIEV Charging cord, and made a adaptor that had a 240ac socket and two mc14 connectors. The power cord should have taken care of all the proper proximity switch etc, but it never would charge. I only let it run for a minute or so, And I could hear the charger making a audible noise hf buzz sound so I switched it off and did not continue any other testing as I did not want to blow anything up. Everything worked ok after the test. I did not know what was inside the charger back then, so I wasn't sure if I possibly was applying dc across the primary of a transformer or something, so I did not want to do that test for very long. Maybe the CHGP Signal is like a dead mans switch. If any of the pulses on the input of the 123 are missing, then the CHGP Signal goes away, and the EV-ECU Turns off the OBC Relay 12v supply. That is why I could get the EV-ECU to switch on the OBC RELAY when I connected my ohm meter to the CHGP Pin, but since it wasn't the right pulse setup, it would time out and shut down after a few seconds. Way back at the beginning of this thread, Kenny mentioned a Charger made by LIER as a possible alternative. I had a look at the one they use in the Chevy volt. There were two things I was concerned with using that charger. One was what to do about this CHGP signal, and the other was if the CANBUS communications would be any posibliity of being compatable. In the Lear Charger, you set all the voltage and current settings programmed into its memory via a USB link to a laptop, then it runs on its own from there. Like Coulomb said earlier, without canbus communications being integrated correctly, there would be problems when the BMU/CMUs are trying to balance cells while this charger is doing its thing seperately. Well, that still tells us something. Thanks. That sounds better than using 240 V mains. I'm just concerned that when we figure out how to get the IGBTs switching, that something will blow up. With only 30 V (or less if you can switch it down) on the IGBTs, they are much less likely to blow up. 400 mA should be fine with no load on the charger, and that's what we want for a while, it seems to me. However, there is the possibility of damaging the power supply since it has no current limiting, so don't use if it you need it for something else. Here are my notes on the AC detection coming out the side of the doghouse on the bottom board--not sure i will draw this up unless it proves necessary, but here it is for placeholder. While checking over your drawings you just sent, I was looking over the section on the bottom PCB next to CN1 Connector. was not making contact to the pads. You can see it on the attached photo, between IC501 and D501. The resistor connects to pin 3 of IC501. It is a 39K resistor. So this would definitely been "A" problem, not sure if it is "The Problem"
First time I've tried to do SMD work in a while, I don't have a SMD Rework setup, so my soldering iron was a bit like cracking a walnut with a sledge hammer. After messing around with it for over an hour including having the bit smaller than a grain of rice flick up into the air and searching for it, finding it and having another go, I finally gave up, and used a thru hold resistors with leads bent soldered to the pads. skylogger wrote: ... was not making contact to the pads. You can see it on the attached photo, between IC501 and D501. The resistor connects to pin 3 of IC501. It is a 39K resistor. Well spotted. IC501 seems to be some sort of non-active thing; it doesn't seem to have power supply pins. Unless they're pins 7 and 8, but it doesn't look like it. But they connect to PC312 and PC313, which despite their designations (PC sounds like Photo Coupler to me) are isolation amplifiers. They seem to head off to the output filter section. So I'd guess that they are measuring charger output voltage and current. 39 kΩ is a fairly high value, so it's likely to be in an analog circuit, consistent with the isolation amplifiers. First time I've tried to do SMD work in a while, I don't have a SMD Rework setup, so my soldering iron was a bit like cracking a walnut with a sledge hammer. They will obviously lose a lot of money on just that, (they are the last Australian supplier with free shipping), so it would be nice to order something else at the same time, perhaps some solder wick, or thin lead-free solder, etc. I'll wait till I get some feedback from you and Coulomb before I try firing it up, so as not to damage anything. Well, I think it's worth a try, considering that this might be the only problem. I forget now... were your pre-charge resistors burned? If not, I'd say try it out in the car. If those pre-charge resistors were burned, I'd say wait till we can figure out a more gentle test. Edit: of course, you had the parts on the daughter board blown up. And we now know that these are associated with the charger output. Let's see what Kiev has to say.